With MY.B (= My Base and My Berlin) CA Immo is creating an additional office building of around 16,500 m² (177,605 ft²) GFA in Europacity Berlin. The name MY.B refers to the building concept, which has a special design geared towards the requirements and ideals of modern working methods and office solutions. 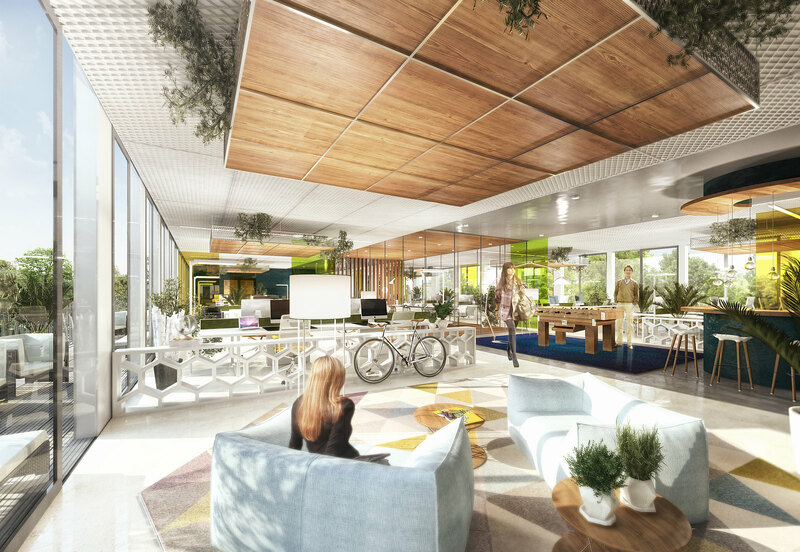 A variety of informal communication zones and a large, multi-functional lobby with a café, lounge and co-working areas, bring the urban feel of the city into the building. An additional meeting, conference and fitness zone can be hired flexibly, whether it be for workshops, personal training or yoga classes. Outdoor terraces accessible from the lobby and the green, open inner courtyard also offer flexible working and meeting spaces. Few other locations in Berlin currently combine more location-related benefits. Thanks to the close proximity of the Hauptbahnhof (central station) and Heidestraße, not only do MY.B and Europacity have excellent transport links, but the Spreeufer (banks of the Spree), the Spandauerschifffahrtskanal (Spandau ship canal) with its beautiful walks, the museum for contemporary art in the Hamburger Bahnhof and the government district are just a short walk away. Europacity represents the emergence of the most modern and innovative office and residential location in the city. The architecture of MY.B created by international architectural office Henn also lives up to this claim. The frontage of the 120 m long MY.B building follows the course of Heidestraße, which has a significant kink in it here. The facade incorporates this kink on the top floor and then staggered by a few metres as it goes down from storey to storey. The modern office spaces in MY.B are spread over six floors. Virtually any type of office can be created here, from open space to combined or individual offices. Modern technical infrastructure geared towards the increasingly digitised world of work supports all the tenants’ office concepts. As well as offering parking spaces for motor vehicles, the building's own underground car park also offers charging points for electric cars and e-bikes. MY.B also provides bicycle parking spaces and showers. The aim is to obtain a gold DGNB certificate for the sustainable building. The building will be completed in 2019.